When Was the Last Time You Cleaned Out Your Closets? At EZ Storage® in St. Louis, we’re here to help people find the right self-storage unit for those belongings that they want to keep, but that they don’t want taking up space in their house. These items can be furniture, appliances, clothing, and more, and when put in storage, they can be protected for as long as you need. However, what about those belongings that are taking up space that you’re not even aware of? The main areas where this happens are in the closets throughout the house, where boxes and tubs are stuffed and often forgotten about. When was the last time you cleaned out your closets? You may go digging through one or two each year looking for holiday decorations, but when was the last time you pulled everything out and went through each box? 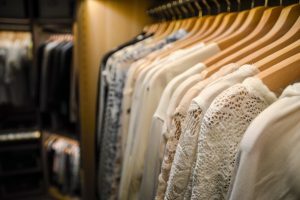 If can be overwhelming to think about what might be lurking deep in your closets, such as old high school photos or that prom dress you thought you donated a long time ago. It’s a good idea to start small, such as the coat closet by the front door or the linen closet in the main hallway. These smaller spaces have less room, so you won’t have to spend as much time going through each box. Chances are, you’ll find plenty of things you can toss or donate. If you have a walk-in closet in your master bedroom, then you likely utilize it mostly for hanging clothes and storing your shoes. Along with your spouse or partner, you’ve filled the space with your wardrobes, but what about those boxes that are sitting up on the high shelves, or the boxes that are stuck behind the hanging rods near the floor? With the master bedroom closet, the principle of “out of sight, out of mind” often comes into play, even though you walk by or see these boxes nearly every day. You’re not going into the closet to retrieve a box, but rather to choose an outfit. However, you can create more room in your closet by moving those boxes into storage. Most of the time, these boxes contain personal items and family heirlooms, and by putting them in storage, you can better protect them from damage. Perhaps you want to add a new closet organizer to a certain closet in the house. This might include new shelves, drawers, and more, which means there will be less space for big boxes and plastic tubs. There might be things in those boxes and tubs that you want to hold on to, but there isn’t anywhere else in the house to store them. By renting a self-storage space, you can safeguard these items and create the room you need to install your new closet organizer. If you’re gearing up, both physically and mentally, to clean out the closets in your home, then let EZ Storage® help by providing you with an affordable self-storage rental. You can choose the size you need and then bring your belongings when you have time. With monthly rentals, you can store things for the time you need, without being locked into a long-term contract. We have four storage center locations across the greater St. Louis area, and each one can provide a unit that works for you. The staff members and resident managers at each facility are always happy to help, and they’re more than willing to answer any questions you have. Stop by today to learn how we can help you keep your home more organized! This entry was posted in Self-Storage St. Louis and tagged affordable storage, self-storage, self-storage near me, self-storage units, storage near me, storage units on February 4, 2019 by admin.